Finally made my way to a remote area of Carter County, TN called Frog Level. It is out there! 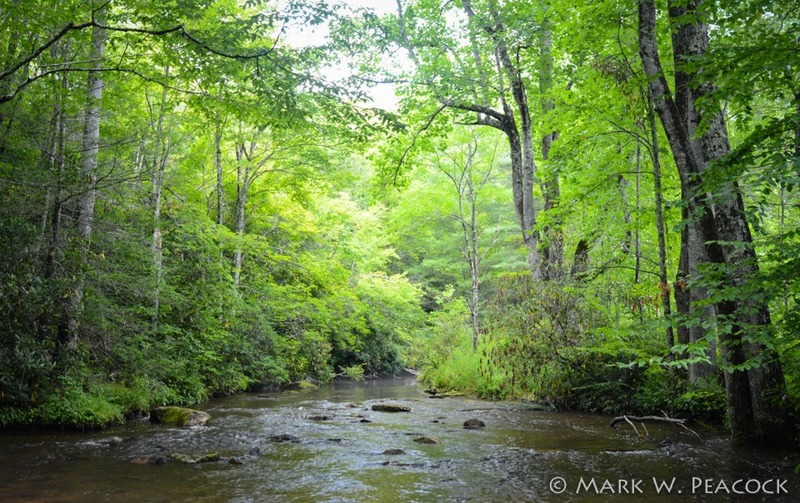 The people who probably know this area best are the fishermen who wade the many streams in search for brown and brook trout. But there are also many trails to be explored for those interested in hiking and camping. Visiting for the first time, I had to go to the topo map to try to make sense of all the intersecting trails and streams. I've done my best in creating a basic overview map of all I've discovered in Dennis Cove for those venturing into this wilderness for the first time. The naming or origin of Frog Level remains somewhat of a mystery to me. The area does have a number of creeks and smaller streams. 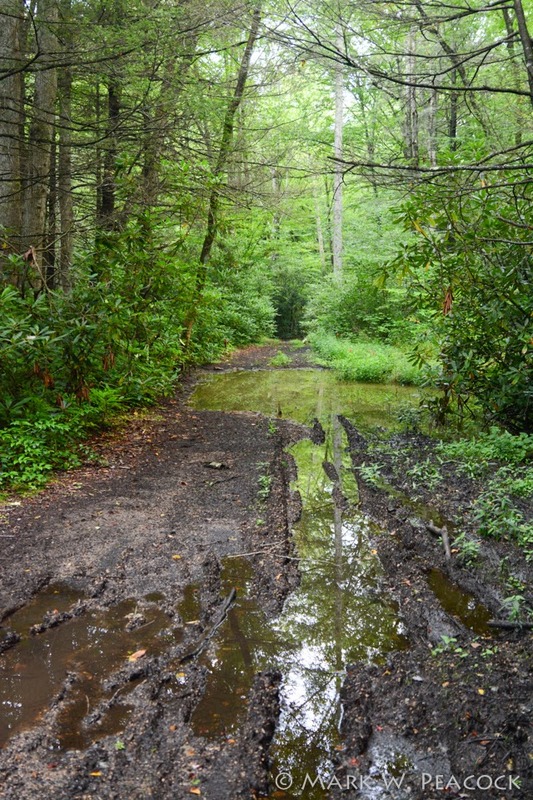 And after a heavy rain (as on the day we went), you'll encounter bogs in the road/trail (wear an old pair of shoes). But Frog Level itself is a pleasant area of open meadow. I saw one reference online that a railroad spur once came through the area to haul timber. Another said these open meadows were where timber was stacked awaiting transport, and are now mowed and maintained by the forest service as a wildlife habitat. Directions: From Rt. 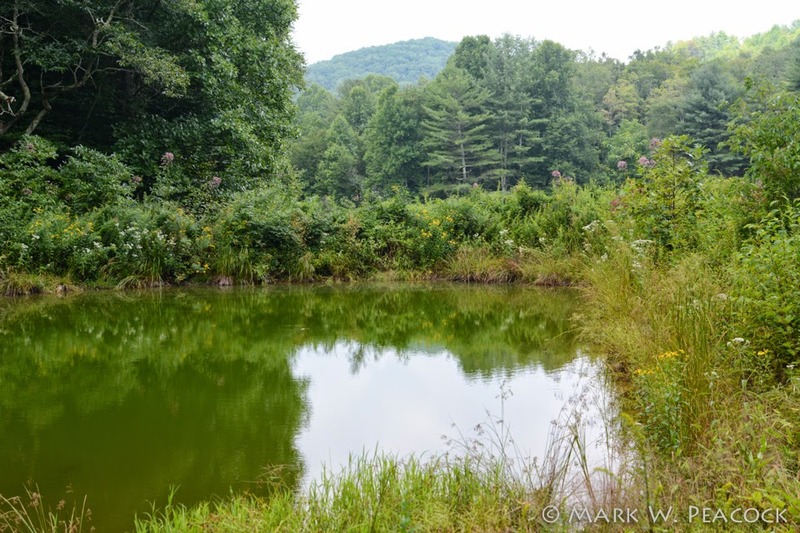 67/321 in Hampton, TN, take Dennis Cove Road for 4.8 miles to the Dennis Cove Campground. From there it is another 1 3/4 miles (road eventually becomes gravel) to an unmarked forest service road to your right (gate should be open) that leads you to Frog Level. This narrow, gravel road is in surprisingly good shape, but I would still definitely recommend a high clearance vehicle for this trip. Although it's only 2.1 miles from the main road to the cul-de-sac parking area, it'll seem longer than that. Park and you'll find where the road crosses the creek (it's now gated). (btw...If you take the trail to your left, up this small stream, you will quickly come to Firescald Falls). The old road can be muddy! Crossing the creek... You can try to rock hop, but you're going to end up getting wet eventually anyway, so you might as well just take the plunge. You'll cross three shallow creeks in rapid succession before coming to the first meadow. 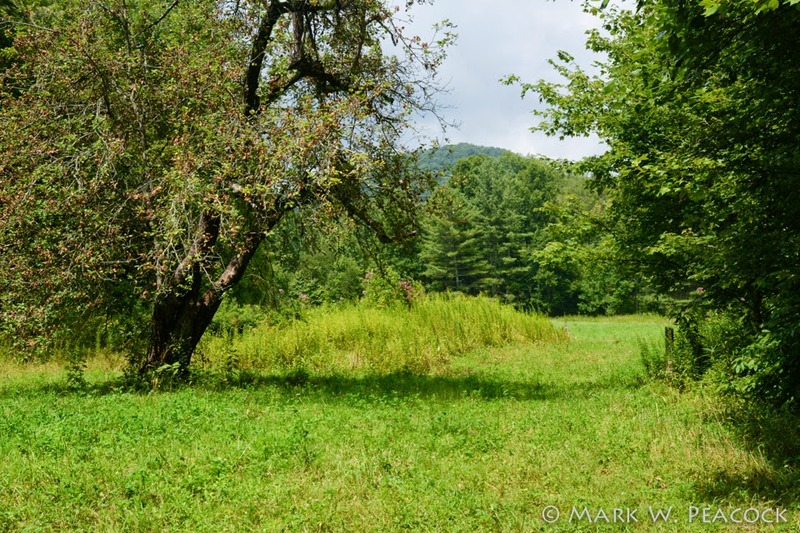 Continue on you'll immediately come to a larger meadow after crossing Laurel Fork -- in the far corner of this meadow is a small pond (pictured here). 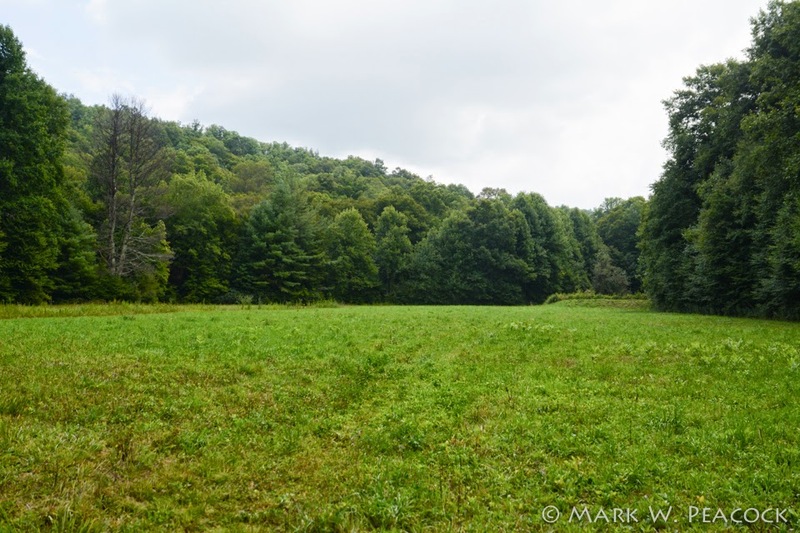 Here you'll come to a fork with Lacy Trap heading southwest to eventually meet up with the AT in 3-4 miles, and Laurel Fork trail which will continue on to the southeast, eventually ending at Walnut Mountain Road. Laurel Fork Trail actually runs all the way from Dennis Cove to Frog Level and then on to Walnut Mtn Road, for a total of 7.9 miles. It's just a beautiful area -- and a lot of fun to explore. See the Google Map for the satellite view of the meadows (note the AT is mislabeled). More detailed trail map is here. 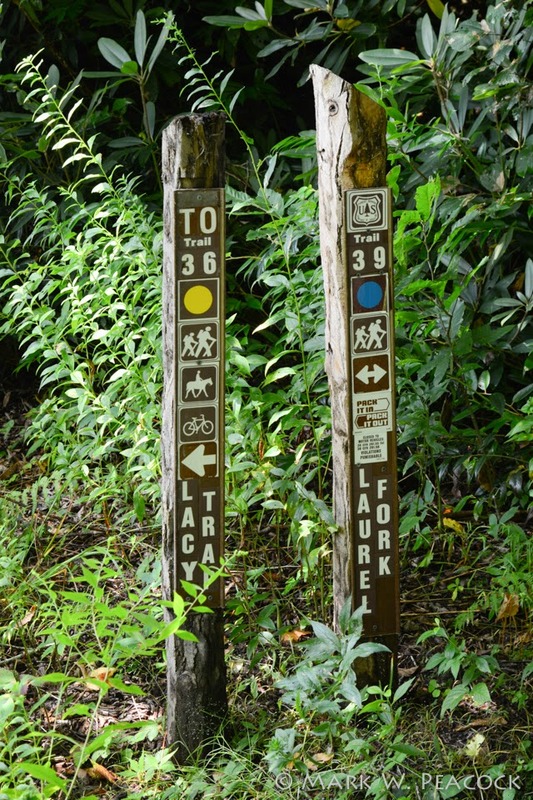 If you continue on a little further on the Laurel Fork Trail, you'll come to Upper Laurel Fork Falls and Campbell Falls. Mike Stillwell has written a nice description here. With all the creek crossings, this is only recommended as a summertime hike! I'm still learning about this area! If you have advice or suggestions, please leave a comment and let us know. Frog is one of the most special places I've ever been and well worth the effort. Take a buddy and be careful!Incredible scenery,especially in the fall, diverse and beautiful. Was surprised on one visit to find a big mallard duck swimming along a couple miles above Upper Laurel Fk Falls. Who knew? I love the sound of Frog Level. Can you clarify for me...how far is it to Frog Level from the Forest service road? The forest service road that leads from Dennis Cove Road to the parking area is 2.1 miles long. It's the squiggly black line in the map above! :) It's slow going, but last time I was there, the road was in pretty good shape. The parking area at the end of the road is actually pretty large. A friend of mine showed me this place in 2017. He camps there a couple times per year. It's a very pleasant place to hang out with suitable camping spots at the edge of the clearings. Clearings are about 1/4 mile from parking area. I wore sandals for the several creek crossing then changed to boots. I think the gate is closed during winter. I plan to visit there this summer.